This article will help you to plan your FLAC files or any other lossless files in iTunes. Itunes doesn’t support FLAC formatted files, so it has to be converted to Apple Lossless, also known as ALAC. We are converting the file from lossless to lossless and hence the resultant would be lossless. FLAC is an abbreviation of the free lossless audio codec. The full form itself states that audio which is compressed in FLAC is loss free. FLAC is free and open source format and therefore can be played in any music player in cars as well as home. But Apple devices such as Mac, iPhone, iTouch & iPad are an exceptional case for FLAC. It is not that you can’t ever play audio of FLAC on Apple devices but for that, you need to go through particular procedures for conversion of the file. 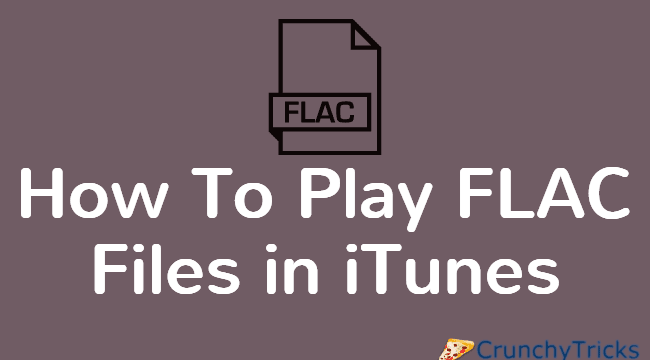 If you have bought or downloaded any music in FLAC files, and you wish to play them in iTunes, but not able to play them directly or as easily as in other players then don't worry. At the end of this guide, the solution will be in your hand. Here, you need to convert your audio files into Apple Lossless i.e. ALAC. ALAC is an equivalent lossless format being supports by iTunes. Conversion of records from FLAC to ALAC is totally lossless. Therefore there is no difference in the quality of the converted files. Apple states that audio files which are being compressed using ALAC use about 50% of the storage space that would be required by uncompressed data. ALAC is played on all Apple devices. Here, best ways of conversion are mentioned with required details and explanations that would surely be helpful to you. To convert audio files from FLAC to ALAC, XLD (X Lossless Decoder) is a most recommendable option. It has an ability to convert files from any audio format to any other audio format of your wish. It converts data without any difference in its quality and retains metadata, tags along with track information and album artwork. XLD is lossless decoder specifically for MAC OS. It is a specially designed tool for MAC OS only. XLD is capable of decoding/ converting/ playing various types of lossless audio files. The audio files that are supported can be partitioned into some tracks with cue sheet while decoding. It is a universal binary. Therefore, it runs on both PPC Macs and Intel Macs. It works on Mac OS X 10.4 or above. XLD supports various formats, namely FLAC, Monkey’s Audio, Wave pack, TTA, Apple Lossless, TAK, WAV, AIFF, etc. For windows, XLD is not going to work. Therefore, you have to use a particular tool of conversion which is specially designed for windows. So if you are using windows, you need to use a tool named dBpowermap that is specially developed for Windows. This tool offers both free version as well as paid version. If you go for a free version, you will have the facility of converting files to the required format. But if you go for paid version, along with file conversion you will also be able to rip CDs, edit tags, batch convert, album art and much more. DBpowermap is a standard music converter for audio conversions, having over 30 million users across the globe. It can convert FLAC, mp3, Apple Lossless and more effortlessly. Some of the salient features of this tool are the mp3 converter, batch conversion, high-speed conversions, DSP effects, no malware/malware free, simplicity. This tool offers a free version for few days and paid version for predetermined period both with same facilities. There is one more tool that may be helpful to you if you are a Mac user. A tool named Rogue Amoeba’s Fission. This tool is specifically designed for Mac users only. This particular audio editor has exciting features like the choice for trimming, editing audio files and joining. It also allows conversion of the file of whatever format into AAC, FLAC, MP3, Apple Lossless, AIFF, and WAV. With the help of this tool, audio editing has become simple and is no longer a chore. With this tool you can crop and trim audio, join files and also split up long files rapidly. This tool is exquisite for fast editing and converts audio without any loss in quality and errors in editing. Salient features of this tool are full FLAC support, Fade away, Cross-format conversion, cropping, chaptered AAC and MP3 files, quick audio removal, file joining, inline gain adjustment, Cue sheet support, Split points and more. If you just want to convert your file to another format, this tool would not be very recommendable. In this case, Mac-editing-app is more preferable. One more thing that should be taken into consideration is that do not ever convert lossy files to lossless files. Once the data is lost, it is permanently gone. You can convert MP3 or AAC file to Apple Lossless / FLAC file, and this will be perfectly of the same quality as it is in original quality. The only way to create lossless files is to rip your CDs in lossless format or buy downloads in Apple Lossless or FLAC formats. So if you convert lossy files to obtain the better sound quality video, it is only going to waste your time. These are the ways through which you can play your FLAC or lossless files in iTunes. I hope, this article helps you in getting your solution. For any query feel free to leave a comment below.